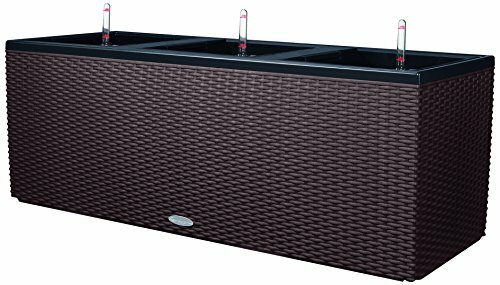 This innovative planter features 3 independent liners with water reservoirs, each is equipped with its own a water gauge, which indicates when the reservoir is empty and needs to be filled with water. Water is conveyed directly to the roots of your plants by a unique funnel system which keeps the top soil surface area dry. When used indoors, these dry surface areas effectively reduce gnats and fungi. A specially formulated granular material, LECHUZA PON, separates your potting soil from its water reservoir, helps aerates the roots, provides nutrition and helps regulate adequate water supply. This attractive planter has wicker like finish and is suitable for both indoor as well as outdoor use. Perfect for patios and as a space divider. Ideal for blooming plants, edibles and foliage. Optional trellis and pedestal available.